I’ll come back to pick up the kids later. Picking out the family Christmas tree is a time filled with tradition, wonder, and a lot of elbow grease on your part. While everyone loves to give opinions on the perfect tree, they seldom stick around to strap your prickly new friend to the car. While the kids sip on hot chocolate and sing carols, follow our tips on how to transport a Christmas tree to get it home in one piece. 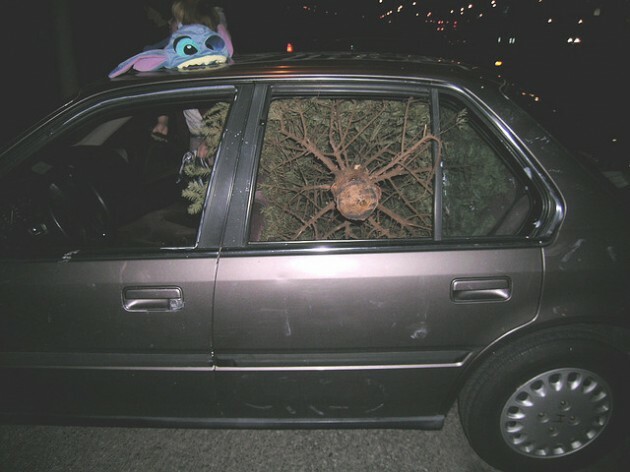 A great example of holiday tree transport. Before you head out to the tree lot, make sure you have the following ingredients to maximize your holiday cheer, which is directly proportionate to how many pine needles stab your arms. Sure, that nine foot fir looks fantastic on the lot, and it may even fit inside your living room with a bit of trimming, but will it fit on the roof of your SUV? Can you lift it on your own back at home? Be sure that you’re picking out a tree that is not only free of bare spots, but will also realistically fit on top of your vehicle without extending too far past the bumper. Even if the family falls in love with a giant, they’re probably going to disappear when it’s time to strap it to the car, so make sure you can handle it. 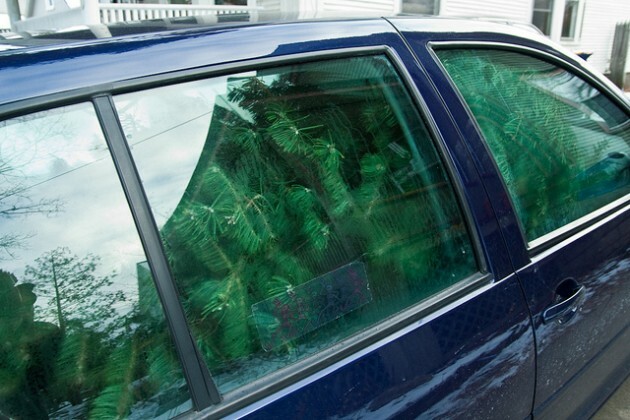 For hauling your evergreen a great distance, you’re going to want to have a roof rack to help anchor the tree on the top of the car. If you don’t have a roof rack, bribe a your truck-owning friend with promises of eggnog back home. Most Christmas trees will come netted (if you buy them from a lot, anyway; they tend not to come netted in nature), so be sure to leave them that way so that carrying it is more manageable. 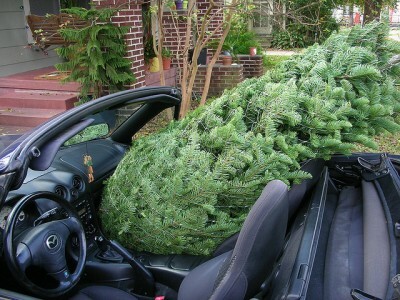 To avoid paint scratches, lay your tarp or blanket out on the roof of the car before mounting the tree up there. Spread it out to cover the entire top to also protect from pieces that fly off in transport. If you’re hauling in the back of your SUV or minivan, lay down a blanket or tarp to protect your interior from sap stains. Doesn’t your car look cozy? As This Old House points out, you’ll want to have the stump facing the front of the vehicle to help avoid damage to the branches. The best way to transport a tree is to cover it completely to keep the wind from drying it out, so if you have a second tarp handy, roll the tree up in it before hauling it onto the roof. If your tree is indeed going on the roof, The Globe and Mail recommends against bungee cords, instead recommending ratchet-style tie-downs. 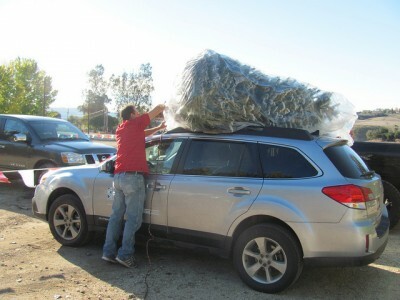 Before you leave the lot, make sure to give the tree a firm tug to ensure that it’s not going anywhere. Tie a piece of orange ribbon on the end of the tree if it is hanging out past the bumper. Once you get driving, take it slow and put on your hazard lights. Highways are not your friend when you have a potential eight feet of flying, piney, green death on top of your vehicle. Back at home, wrap the tree in the tarp laid on the roof to keep needles from getting all over the house. From there, we’ll leave you with some tips on caring for your Christmas tree through the season. Don’t take Stitch’s lead on any DIY job. Share pics of your successful tree hauls on Facebook!